St Paul’s Cathedral is one of the largest churches in the world. It is located within the City of London on Ludgate Hill, the City’s highest point. The cathedral was designed by Sir Christopher Wren, as an important part of a huge rebuilding plan, after the Great Fire of London in 1666. Wren also designed over 50 other London churches. St Paul’s Cathedral was the tallest building in London from its construction until 1962. The dome is the second largest in the world at 366 feet high and is reached by climbing 259 steps. started by the Normans and completed by about 1240. One of the most well known features of the cathedral is the Whispering Gallery. A whisper against the wall can be clearly heard at the other side, 112 feet away. The cathedral’s crypt is the largest in Western Europe and extends the entire length of the building. There are over 200 monuments and memorials in the crypt. The cathedral was hit by several German bombs during the Blitz in World War 2. One was removed before it exploded; had it done so, it would have totally destroyed St. Paul’s. 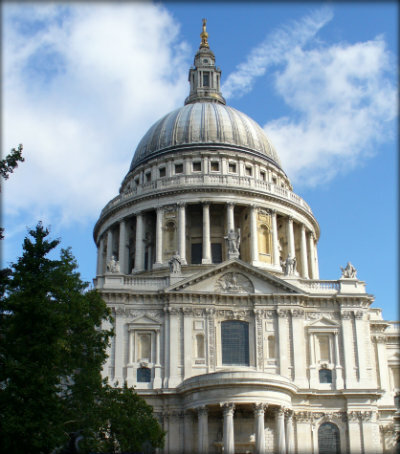 Sir Christopher Wren was the first person to be buried in St Paul’s Cathedral. The cathedral’s largest monument is that to the Duke of Wellington, depicting the Duke riding a horse. Funeral services for several famous people have been held at St Paul’s, including Winston Churchill and Lord Nelson. The wedding of Prince Charles and Princess Diana was also held there. St Paul’s Cathedral has been painted by such famous artists as Pissaro, Canaletto and Turner. It has also been shown in several films, including Mary Poppins, Sherlock Holmes and one of the Harry Potter films. Who is buried in St Paul’s Cathedral? What next? Discover more facts about London.